What about this method? Is it a typo? Or just a possible addition to the study guide? Cedric Georges wrote: No, it isn't a typo. This could be an addition in the book, showing the possibility of using this new method. True! But don't forget you are using a certification study guide. Its sole and only purpose is to prepare you for the exam. So it focuses mainly on the methods you need to know for the exam, not on every API method. I've added the missing semi-colon and wrong data type to our errata list and credited you with the finding. Good eye! Arrays.parallelSort() is intentionally not mentioned. 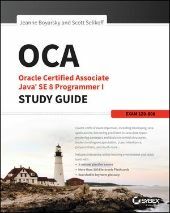 The OCA exam only covers basic concepts and parallelization (or threading or concurrency) is not in that scope. The OCP exam does cover parallelization and the fork join framework (which parallelSort uses behind the scenes.) It doesn't cover this particular API though because it isn't in scope for the exam. Fun note: Arrays.parallelSort() delegates to Arrays.sort() for small arrays. Jeanne Boyarsky wrote: Fun note: Arrays.parallelSort() delegates to Arrays.sort() for small arrays. And what's considered as a small array? 1000 elements? Or maybe 1 million? And does it make a difference if the array contains primitives or objects (which might have a complex graph and thus have a complex sorting algorithm)? Roel De Nijs wrote: And what's considered as a small array? 1000 elements? Or maybe 1 million? And does it make a difference if the array contains primitives or objects (which might have a complex graph and thus have a complex sorting algorithm)? Which is 8192. I have no idea why they picked this number. And it doesn't vary by type.